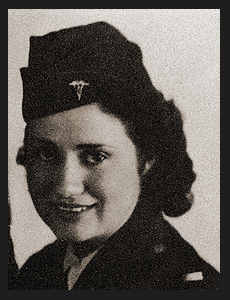 1st Lt. Pauline I. Hunt, daughter of Mrs. W.P. Hunt, attended school in Hollister and Ft. Worth, Texas. Enterred Army Nurse Corps in Sept., 1941, trained in Luke Field, Kingman, Ariz., Las Vegas, Nev.; served in the Hawaiians and the Philippines; is now enroute to U.S. Awarded Am. Defense Ribbon, Asiatic Pacific Ribbon.